In my role as a Michigan DUI lawyer who has been practicing for nearly 27 years (as of this writing), I have literally handled thousands of drunk driving cases. If there’s one thing you can bet on, it’s that after the traffic stop itself, if you’re asked out of the car, you ARE going to jail. This short article will be a bit of a departure from my usual informational, legal examination of some aspect of a DUI case and focus instead on the common, real world experiences of people dealing with a drinking and driving case. 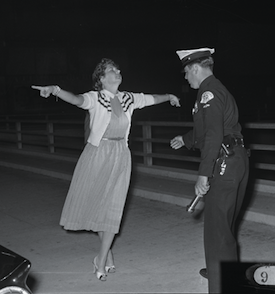 For just about anyone pulled over and suspected of drunk driving, being asked to get out of the car means having to perform some field sobriety tests (FST’s), and that, in turn, amounts to what you could call the “ballet of the bust.” You may stand and balance and walk and count in an effort to prove to the police officer that you’re not drunk, but what you’re really doing, in a sense, is dancing and talking your way into the backseat of the police car. Nor will you ever meet anyone who was suspected of driving drunk, asked out of his or her car to perform FST’s, and then let go. I’m sure there’s someone out there who’s had that happen, but I’ve never met anyone who has, despite having had tons of clients who claimed they did just fine on those tests. Some of these clients, however, do report that they were asked to do test after test after test until they’d eventually screw something up, while others maintain that they were given a roadside breath test (called a PBT for “preliminary breath test”) even though they recall having performed rather well on the FST’s. Certainly not every client is wrong about that, but plenty do, to put it nicely, “remember” things differently when drinking is involved. Look, when you’re legally drunk (or twice or more the legal limit of .08), you don’t process things that well. If you did really well on the FST’s and you remember everything clearly despite being legally drunk, then you’re probably a professional drinker, and that’s even worse! One of the more interesting things I see, and I see it rather often, is the client who remembers handling him or herself pretty well in front of the officer, and who then cringes while watching the patrol car video and seeing how clearly drunk he or she was. As part of my first interview with a new DUI client, I’ll ask about his or her initial contact with the police. I have a number of Matchbox police cars and civilian cars (no, those are NOT for kids) on my desk that we use for the client to show how things went down at the scene of the arrest. While I ask the client to line up the police car (or cars) in relation to his or hers, I’ll also ask about what the officer did as he or she approached the vehicle. Soon enough, we’ll get to that part where the client was asked to step out of the vehicle. Here, I need to take my time and go over field sobriety tests, and the order in which they were given, along with all the other details (including if you had been asked to do a heel-to-toe walk barefoot, on a gravelly, slippery or uneven spot). Most of the time, the client will recall having done “okay,” on some of the tests, while perhaps admitting to not doing quite so well on some of the other tests. No matter how it happens, the story always goes from being asked out of the car to being arrested for a drinking and driving offense. That’s real life. In the fantasy world of hopes and dreams, people start looking for every little thing as a way to invalidate their arrest. Some lawyers are particularly good at this, all the while cashing in on someone’s fears and hopes. To be sure, every aspect of a DUI arrest does need to be critically examined to look for a way to “beat it,” but you have a head full of sawdust if you haven’t figured out that the police are actually good at this stuff. They’re trained for it, continue to receive training for it, and practice these skills by making real-life drunk driving arrests all the time. Do you really think that the police, with any regularity (at least here in the Detroit area), arrest people who aren’t drunk and still charge them with a DUI? Finding things that can have a DUI case thrown out of court is the exception, not the rule. Of course, it is the very exception that the lawyer should look for, but the larger point here is that the police can detect intoxication well enough so that, by the time they ask someone to step out of the car, chances are the person is obviously drunk. And to be clear, “obvious” may not be so obvious to the people you were hanging out with, nor to you or me, nor anyone else, for that matter, but then again, none of us are trained police officers. By comparison, I can spot the loophole in a contract in a matter of seconds that just about everyone else would miss, simply because I’m a trained lawyer. No matter what your occupation, you probably see things without trying that other people don’t. We think we know who is hammered because just about anyone can tell when a person is wasted and falling down drunk, but that’s not what drunk driving is about; it’s about being over the limit. In Michigan, “drunk driving” means operating with a BAC of .08 or higher. “Impaired driving” means having a BAC of even less than that. It’s naive to think that the police never pull someone over without a great reason, but once they have contact with the driver, the smart money is that they can just “tell” who is over the limit versus who is not. That said, it is the job of the DUI lawyer to really examine the circumstances around the traffic stop, because if it can be shown the police officer did fabricate a reason to stop someone, or the stop was just otherwise “BS,” then the whole case can be thrown out of court. Again, however, being able to prove that is the exception, and not the rule. For all the rich celebrities who have been popped for drunk driving, how many of them have you ever heard about beating the case? That’s right; you can’t recall a single one, and it’s certainly not because they couldn’t afford a good lawyer, either. I have previously discussed the importance of obtaining and reviewing the video evidence from the police car dash cam. To me, that’s just a given. If there’s anything that can be used from the traffic stop to get someone out of a DUI, then we’ll see it. On the flip side, if there is nothing to challenge, then we’ll see that, as well. The certainty provided by reviewing the video is really priceless. Yet for all of that, and for everything that can and does happen afterward, the simple fact is, if you’re stopped by the police for suspected drunk driving and are asked out to step out of your car, you are almost certainly going to wind up getting arrested for DUI. If you’re facing a DUI charge in the Detroit-area, meaning any court in Wayne, Oakland or Macomb County, and you are looking for an honest lawyer who will work to make sure you get the best outcome possible, call my office. My office is open Monday through Friday, from 8:30 a.m. until 5:00 p.m., and can be reached at 586-465-1980. All initial consultations are done over the phone when you call. We will discuss your case by asking a few questions, give you a price for representation, and in addition explain how we can help you. Do your homework, check out all the lawyers you can. However, my office will give you the most time, the best information and make you feel more comfortable before ever walking in the door. Read as many articles as you can, and, when you’re ready, call around and ask questions. We’re here to help.